So, come on out late Friday afternoon. 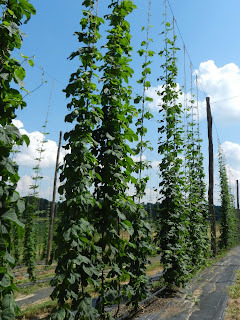 Take a look at these varieties and let's share our experiences growing hops in western NC. As many of our longer-term growers will attest, research such as the variety trial here is so important to the success of this industry. It can help you, the grower, prevent some costly mistakes. When a variety, spray material, or practice doesn't work in our yard, it is "lesson learned for all of us". When it doesn't work in your yard, it is time and money lost. Revised temporary directions to the Mountain Horticultural Crops Research and Extension Center and the Mountain Horticultural Crops Research Station: Construction of the Sierra Nevada Brewery near our facilities has resulted in a temporary road closure for road widening. Old Fanning Bridge Road is closed on the Hwy NC-280 side; that is the direction most people come in on from I-26. So, to get to our facilities from I-26, continue south on Hwy NC-280 for several miles. Turn right on Hwy NC-191 (Old Haywood Road). Go several miles and turn right on Old Fanning Bridge Road. No registration is required. This is an outside event, so dress accordingly. Suggested donation of $5 per person. If you have questions, please email or call Kelly Gaskill, Kelly_Gaskill@ncsu.edu or 828-684-3562."